Sometime we need to refer to old chat logs to get important information already dicussed on a previous messenger chat. Messenger application(s) has feature to see old chat logs but the interface is not comfortable for exploring and reading through loads of chat archive. 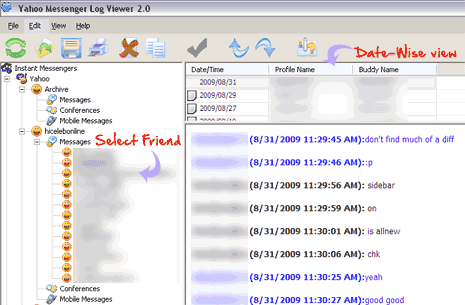 Free application Yahoo Messenger log viewer makes this all easy. It automatically detects logged in Yahoo / MSN messenger accounts and display list of messenger friends on the left sidebar. You can click on individual messenger buddy name to view your old chats with that ID. Top window on right sidebar show dates of different chatting session, click on specific date for chat details for that day.